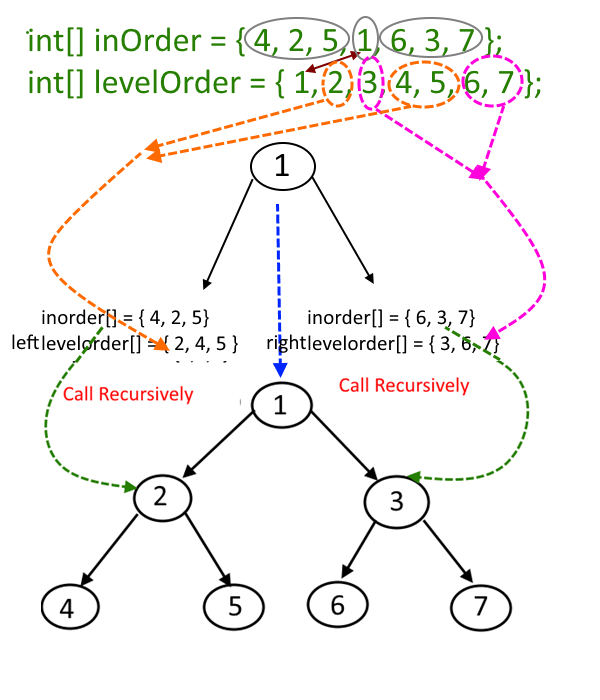 Objective: – Given a inorder and level order traversal, construct a binary tree from that. First element in the levelorder  will be the root of the tree, here it is 1. Now the search ele­ment 1 in inorder, say you find it at posi­tion i, once you find it, make note of ele­ments which are left to i (this will con­struct the left­sub­tree) and ele­ments which are right to i ( this will con­struct the rightSubtree). Suppose in previous step, there are X number of elements which are left of ‘i’ (which will construct the leftsubtree), but these X elements will not be in the consecutive in levelorder so we will extract these elements from levelorder by maintaining their sequence and store it in an array say newLeftLevel. Similarly if there are Y number of elements which are right of ‘i’ (which will construct the rightsubtree), but these Y elements will not be in the consecutive in levelorder so we will extract these elements from levelorder by maintaining their sequence and store it in an array say newRightLevel. From previous two steps construct the left and right subtree and link it to root.left and root.right respectively by making recursive calls using newLeftLevel and newRightLevel. See the picture for better explanation. 249 queries in 0.133 seconds.